Mother’s Day is this weekend, and if you already presented Mom with a rose bouquet last year, an option for this year is orchids. Wagner Vendrame, a professor of environmental horticulture at the UF Institute of Food and Agricultural Sciences, specializes in growing and preserving orchids and says orchids make a great Mother’s Day gift. 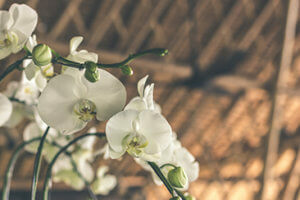 “Between a bouquet that lasts one or two weeks at most and an orchid that can stay in bloom for three months and live up for 15 years or longer, orchids are definitely a winner for any mom’s heart,” Vendrame said. Orchids are big business in Florida. According to the latest U.S. Department of Agriculture-Floriculture Crops report, the value of potted orchids sold in 2015 was $78 million in Florida, and $288 million in the U.S. These sales in Florida had an estimated economic impact of 2,208 jobs, UF/IFAS economists say. Orchids offer a variety of colors, patterns and large flowers that make a statement and a focal point in any home, Vendrame said. Some orchids also offer interesting aromas and perfumes, with some having scents resembling lemon or even chocolate. An orchid tends to flower at the same time every year, so the gift can last for years to come, said Liz Felter, a regional specialized horticulture agent with UF/IFAS Extension Orange County. They hardly need to be watered because the roots will absorb moisture from the environment if they are outside in a shaded area, she said. For more information, visit ifas.ufl.edu.